PCI DSS provides a baseline of technical and operational requirements designed to protect cardholder data. This applies to all entities involved in payment card processing – including merchants, processors, acquirers, issuers, and service providers, as well as all other entities that store, process or transmit cardholder data. PCI DSS comprises a minimum set of requirements for protecting cardholder data, and may be enhanced by additional controls and practices to further mitigate risks. There are six key areas addressed in PCI-DSS. All WSO2 servers should be running behind a firewall - which only let in filtered traffic. Firewall rules should only permit a selected set of context paths to the WSO2 servers. In case a given server being deployed in DMZ, make sure only the required components are installed. WSO2 Feature Manager supports removing all unnecessary features. Say, for example, if you deploy WSO2 ESB as a Security Gateway in the DMZ, you can remove the complete UI Management console from it. Change the key stores. You can find two key stores (.jks ) that ship with WSO2 products at CARBON_HOME/repository/resources/security/ . Out of those two, wso2carbon.jks is the primary key store and client-truststore.jks is the trust store, where you will have the public certificates of trusted Certificate Authorities (CAs ). Once you change the key stores, you need to update the corresponding entries in the following configuration files. Use Secure Vault to encrypt all the passwords in the following configuration files - and make sure all default passwords are being changed. All connections to the user stores (LDAP / AD) should be over TLS. Make sure any connection initiated from the WSO2 Carbon servers to the card holder data storage is protected by network/firewall rules or running over TLS. WSO2 Servers store client credentials as a salted hash. Make sure you configure for a strong hashing algorithm. Make sure your application data storage is well protected with encryption and access control rules. Make sure data exposed via APIs hosted in WSO2 servers enabled only on TLS. Access to the Management Console of WSO2 servers protected with TLS. WSO2 products do not maintain user credentials or any confidential data in cache. Make sure the operating system, where WSO2 middleware running on, is up to date. Enable automatic update checks. Make sure all the latest security patches for the WSO2 products are applied. All WSO2 productions customers are immediately informed whenever a security vulnerability being uncovered. All WSO2 products go through static code analyzing tools and OWASP recommended tools to identify and mitigate security vulnerabilities at the code level. WSO2 is part of all standard bodies, OASIS, W3C, IETF and other prominent open source communities. We are notified whenever a vulnerability being discovered, either at the code level or at the specification level. Make sure you have proper access control rule at the network level and at the physical machine level where you have deployed WSO2 middleware. Use standard fine grained access controlling to secure all your APIs exposing data. This can be done with XACML support in WSO2 product stack. Have strong Role Based Access Control to the management console of WSO2 products. Always adhere to the principle of least privilege. WSO2 servers, maintain audit logs of all privilege actions performed by end users. Use WSO2 BAM and WSO2 CEP for fraud detection and analyze access patterns. Use network level monitoring tools to detect any violations in access control rules. Authentication and Access Control policies can be developed, governed, enforced and evaluated through WSO2 product stack. OpenID Connect is a profile built on top OAuth 2.0. OAuth talks about access delegation while OpenID Connect talks about authentication. In other words, OpenID Connect builds an identity layer on top of OAuth 2.0. Authentication is the act of confirming the truth of an attribute of a datum or entity. If I say, I am Peter - I need to prove that. I can prove that with something I know, something I have or with something I am. Once proven who I claim I am, then the system can trust me. Sometimes systems do not just want to identify end users just by the name. By name could help to identify uniquely - but how about other attributes. Before you get through the border control - you need to identify your self - by name - by picture - and also by fingerprints and eye retina. Those are validated in real-time against the data from the VISA office which issued the VISA for you. That check will make sure its the same person who claimed to have the VISA enters in to the country. That is proving your identity. Proving your identity is authentication. Authorization is about what you can do. Your capabilities. You could prove your identity at the border control by name - by picture - and also by fingerprints and eye retina - but it's your VISA that decides what you can do. To enter into the country you need to have a valid VISA that has not expired. A valid VISA is not a part of your identity - but a part of what you can do. Also what you can do inside the country depends on the VISA type. What you do with a B1 or B2 differs from what you can do with an L1 or L2. That is authorization. With OAuth 2.0, the client does not know about the end user (only exception is resource owner credentials grant type). It simply gets an access token to access a resource on behalf of the user. With OpenID Connect, the client will get an ID Token along with the access token. ID Token is a representation of the end user’s identity. What does it mean by securing an API with OpenID Connect ? Or is it totally meaningless ? OpenID Connect is at the Application level or at the Client level - not at the API level or at the Resource Server level. OpenID Connect helps, client or the application to find out who the end user is, but for the API that is meaningless. Only thing API expects is the access token. If the resource owner, or the API wants to find who the end user is - it has to query the Authorization Server. The OAuth Token Introspection specification currently does not support sending back the end user identity in the introspection response, but, it would be quite useful to have an user ID Token in the response (as in OpenID Connect) and was proposed to the OAuth IETF working group. Here I am posting some of presentations we did at WSO2 on XML Signature, XML Encryption, WS-Security, WS-SecurityPolicy and WS-Trust for the benefit of anyone who is interested in learning web services security. These are from a instructor-led training, so all the slides are not self-explanatory. 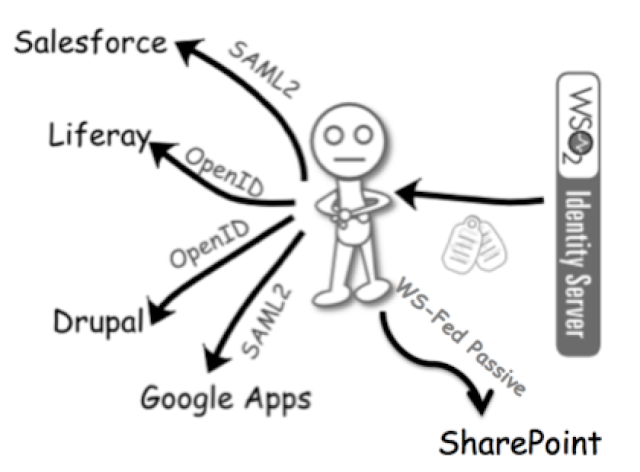 Chained Collaborative Federation (CCF) pattern implemented with WSO2 Identity Server provides following features/benefits. 1. Build a single sign-on solution across multiple web applications supporting heterogenous standards/protocols. You may have a Liferay portal which supports OpenID based login, a Drupal server which requires SAML 2 Web SSO, a web application which relies on OpenID Connect. With WSO2 Identity Server, all these heterogenous standards/protocols can be integrated together to build a unified SSO platform. Once you login to Liferay with OpenID, you will not require to re-authenticate when accessing Drupal or the web application. This can be further extended to build a unified SSO platform between on-premise and SaaS applications (GoogleApps, Salesforce). 2. Collaborative identity federation between multiple heterogenous identity providers. I have a web application that only supports OpenID based login. To enable users from partner companies, out side my domain, to access this - they have to use an OpenID. In other words, each partner company should have an OpenID Provider deployed over their respective enterprise user store. In a realistic scenario, this is not a perfectly valid requirement. We can't expect all our partners to have an OpenID Provider, deployed in their respective domain. One may have an OpenID Provider, another may have a SAML2 IdP, and a CAS server, an OpenID Connect authorization server.. likewise..
With CCF pattern, WSO2 Identity Server provides a platform to integrate all these heterogenous identity providers. The web application that supports OpenID login, can redirect any unauthenticated users to the WSO2 Identity Server via OpenID Directed Identity. Then Identity Server will give the user an option to pick the Identity Provider he wants to authenticate against. This identity provider may support SAML, OpenID, OpenID Connect, CAS or even a proprietary protocol. The Identity Server will take care of bridging the requested protocol (OpenID in this case) with the user selected one and initiate the flow. User will be redirected to his own Identity Provider and comes back to the Identity Server with the response. Identity Server will then build an OpenID response from it and send back to the web application. Currently Identity Server can integrate clients and identity providers, who support OpenID, OpenID Connect, OAuth, SAML2 and WS - Federation (Passive). We are planning to add support for CAS in the future. Some of the benefits of this approach. Client application only needs to trust its own Identity Provider - not aware of any external Identity Providers. The trust relationships between connected partners are maintained centrally. 3 . Home realm discovery. In previous case, when an external user being redirected to the internal IdP (Identity Server) - he has to pick his Identity Provider from there. With the support for home realm discovery - Identity Server is capable of deriving user's home IdP from the request. So - the complete redirection flow will be transparent to the end user. 4 . Integrated Windows Authentication (IWA). WSO2 Identity Server supports IWA. With this, we can faciliate Zero-login for your web applications that rely on OpenID, SAML, OpenID Connect and WS - Federation (Passive).